The past three years have seen the Toronto Raptors become the class of the Atlantic Division. The Raptors have focused on basketball fundamentals which has led to more wins and a growing fan base in Canada. The Raptors will begin the upcoming NBA season as the three-time defending Atlantic Division Championships, and after Toronto reached the Eastern Conference Finals last June for the first time in franchise history, the expectations around this team have increased. Dwane Casey is set to begin his sixth season with the Raptors and in each of his campaign’s in Toronto, the team’s win total has increased. And after the Raptors won a franchise best 56 games last season, they are poised to once again be one of the better teams in the Eastern Conference. 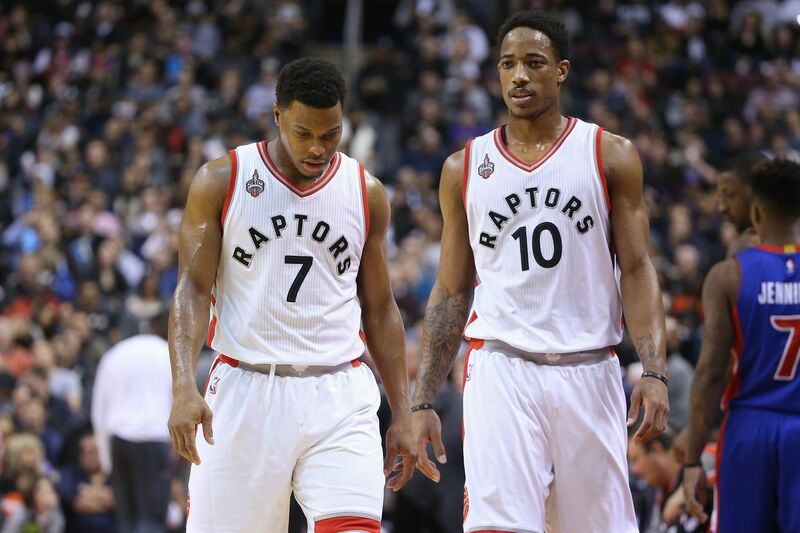 The backbone of the Raptors has been their All-Star backcourt of point guard Kyle Lowry and DeMar DeRozan. DeRozan averaged a career-high in points last season at 23.5 points per game as he continues to improve as a perimeter shooter. Lowry’s numbers have continued throughout his NBA career as he is emerging as one of the better point guards in the league. Last year Lowry averaged 21.2 points and 6.4 assists per contest and as he intends to test free agency next summer. Around Lowry and DeRozan, the Raptors have developing players such as center Jonas Valanciunas. Valanciunas has spent his entire four-year NBA career with the Raptors and his numbers continue to improve as he averaged 12.8 points and 9.1 rebounds last season. Valanciunas is a prime candidate to average a double-double this season which could make the Raptors that more difficult to deal with. The Raptors signed center Jared Sullinger who could be a solid role player in Toronto after he spent the last four years with the Boston Celtics. And the Raptors first-round pick in center/power forward Jakob Poltl could give them another dynamic as a big man that can stretch the floor with his ability to hit he mid-range jump shot. Size has been the one thing that has held the Raptors back in recent years, but as this team continues to get better in the front court, their chances of being a title contender are that much better. The past two years have seen the Boston Celtics become “The Little Engine That Could” of the NBA. The Celtics are not the most talented team in the league, but they scrap and claw on a nightly basis as they are a team that opponents are not excited to face. Brad Stevens is the Celtics head coach, and it is a post that he has maintained for the last three years. And in each year that Stevens has been in Boston, the Celtics win total has increased. The last two seasons have seen the Celtics make the playoffs, but they’ve been unable to advance past the first round. However will things change for the Celtics next spring? Last year saw point guard Isaiah Thomas turn into a star for the Celtics. Thomas led the Celtics in points per game (22.2) and assists (6.2) as he earned his first All-Star Game nod. Thomas has solid ability as a point guard being that is able to penetrate, but for the Celtics to take that next step they are going to need a consistent low-post presence. For the last nine years, center Al Horford has been one of the cornerstones of the Atlanta Hawks. With the Hawks, Horford was a four-time NBA All-Star as he averaged 14.3 points and 8.9 rebounds during his time there. But when Horford became a free agent this past summer, the Hawks signed center Dwight Howard which made him expendable. 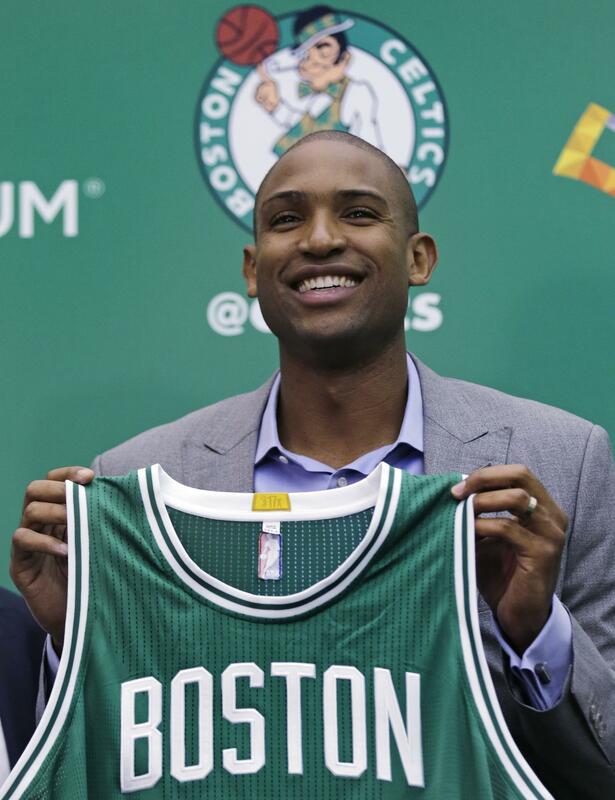 And when the Celtics offered Horford $113 million on a four-year deal, he jumped on it. Horford gives the Celtics a dependable scorer in the post, and he has already been named as one of the team’s captains which gives you an idea of the respect that he commands. The combination of guards Marcus Smart and Avery Bradley continue to pester opponents with their frenetic play at both ends of the floor. Both Smart and Bradley are two of the better defenders at the point guard position along with each player providing a change of pace on offense which gives Stevens more options as he preaches versatility with his team. Veteran small forward Jae Crowder should be able to feed off of Horford’s presence in the front court as he no longer has to be the Celtics primary scoring option in the post. The Celtics have high hopes for their first-round pick in small forward Jaylen Brown. But a sleeper on this roster could be rookie forward Ben Bentil who averaged 21.1 points and 7.7 rebounds last year in the college for the Providence Friars. Aside from leading the Friars in scoring and rebounds, Bentil also led the team with 52 made three-point field goals, and his scoring ability will be huge off of the bench for the Celtics. Five of the Celtics first six games this season will be at home, and a fast start could be just what they need to push the Toronto Raptors for the top spot in the Atlantic Division. When Phil Jackson became the president of the New York Knicks in March 2014, he brought excitement and expectations to the franchise. But in two seasons under Jackson’s regime, the Knicks have only managed to win 49 games, while the man that he was grooming to be the next “great head coach” in Derek Fisher was fired last season after the team got off to a 23-31 start. Kurt Rambis would be named as the Knicks interim head coach for the remainder of the season as New York went 9-19 under him. But what was even more surprising than the firing of Fisher was that Jeff Hornacek was hired to be the new head coach of the Knickerbockers. The Knicks will be Hornacek’s second NBA coaching gig after he compiled a record of 101-112 in nearly three seasons as the head coach of the Phoenix Suns. Hornacek was never able to lead the Suns to the postseason, and the highlight of his time in Phoenix was when the team won 48 games during the 2013-2014 NBA season. However it is really going to be very interesting to see how the marriage between Hornacek and Jackson will work since Jackson is notorious for hiring coaches that will solely run his triangle offense which isn’t a specialty of the Knicks new head coach who prefers a more uptempo style of offense. The hiring of Hornacek smells of Knicks owner James Dolan once again putting his nose into the day-to-day operations of the team which makes you wonder if Jackson’s days at 33rd Street and Eighth Avenue are numbered? And even though that the Knicks can be described as the best circus in town, this group must find a way to co-exist in order to make a roster that has individual talent work as a team. The centerpiece of any potential Knicks success is small forward Carmelo Anthony. Anthony has been with the Knicks since 2011 and he has given New York a face of the franchise while helping them reach the postseason on three occasions. Anthony also led the NBA in scoring during the 2012-2013 NBA season, but since then his offensive numbers have dipped. Anthony is 32-years of age with a bad knee. And although that Anthony can still fill up the bucket, the clock is ticking on he and the Knicks to win a championship together. The Knicks are hopeful that power forward Kristaps Porzingis will be able to build off of his solid rookie campaign. Last season Porzingis averaged 14.3 points, 7.3 rebounds, and 1.9 blocks. Porzingis came into the NBA being compared to Dallas Mavericks power forward Dirk Nowitzki, and he could be a player that could average 17 points and 10 rebounds this season under Hornacek. This off-season has seen the Knicks bring in an array of veteran players. The Knicks signed former Chicago Bulls center Joakim Noah to a four-year deal that is worth $72 million, while also signing guards Brandon Jennings and Courtney Lee. The Knicks would also acquire point guard Derrick Rose from the Bulls to complete their roster overhaul. But unfortunately for the Knicks, these are moves that should have been made five years ago. In 2011, Rose was the NBA’s MVP as he was one of the league’s brightest stars. However since then knee injuries have derailed Rose’s once promising career. Noah was Rose’s teammate in Chicago where they helped the Bulls to be one of the better teams in the Eastern Conference when they were healthy. Noah was the NBA’s Defensive Player of the Year in 2014 as his toughness and grit defined that era of Bulls basketball. But like Rose, Noah has been dealing with injuries as foot and shoulder issues have limited his effectiveness over his final two seasons in Chicago. The Knicks will be the fourth different team that Jennings has suited up for and he is seeking to find the explosiveness that he had earlier in his career. Like Jennings, Lee has bounced around the NBA as the Knicks will be his seventh different team. Throughout Lee’s career, he has been an underrated defender that should be able to provide a spark off of the Knicks bench for Hornacek. The Knicks will look to push the pace of play more this season under Hornacek, but the most important thing for New York is to have everyone on the same page as it will be very interesting to see how this motley crew comes together as the season progresses. It’s no secret that the Philadelphia 76ers have become the worst franchise in the NBA. The 2011-2012 NBA season was the last time that the Sixers finished with a winning record and it was their only winning campaign over the last seven years. The last three seasons have seen the 76ers combine to win 47 games, and to give you an idea of how bad that it has been in Philadelphia, ten NBA teams won more games than the Sixers last year alone than they were able to accomplish over the last three campaigns. Last season was just about as bad as it could get for the Sixers as they managed to go just 10-72 which led to some wholesale changes. Sam Hinkie was relieved of his duties as the 76ers general manager after he oversaw the worst stretch in franchise history. Former Phoenix Suns owner Jerry Colangelo was brought in by the Sixers as an advisor and his first order of business was to name his son Bryan as the team’s new president and general manager. The younger Colangelo has a proven track record of putting a team together from his time as the general manager of both the Suns and Toronto Raptors as he was named as the NBA’s Executive of the Year in 2007. Now Colangelo is tasked with making the Sixers respectable once again and they could be a team on the rise. 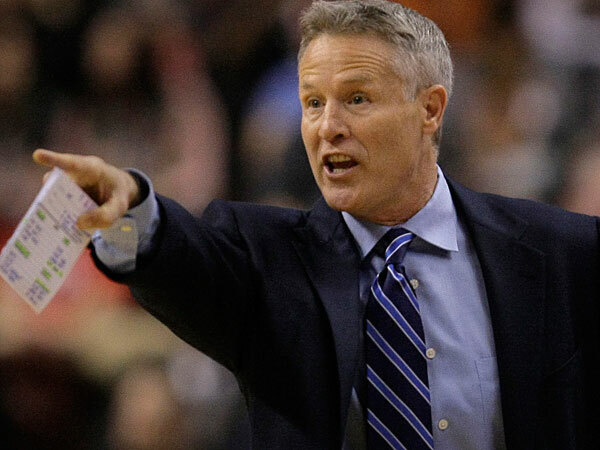 Brett Brown is set to begin his third season as the Sixers head coach and although that the man who hired him in Hinkie is no longer running the show in Philly, he will still be calling the shots on the sideline. The Sixers will begin the upcoming NBA season on the wrong foot as they will be without the services of small forward Ben Simmons. Simmons was the first overall pick of the NBA Draft this past summer after he averaged 19.2 points, 11.8 rebounds, and 4.8 assists in one year for the LSU Tigers. But a foot injury will keep Simmons out of action for at least three months which will postpone his NBA debut. The inability for the 76ers to win games in recent years has led to selecting early in the NBA Draft, but Hinkie rolled the dice on players that weren’t healthy. In 2013, the Sixers obtained the draft rights to center Nerlens Noel from the New Orleans Pelicans, but he missed the entire 2013-2014 NBA season after he recovered from a torn ACL that he suffered in college. In 2014, the Sixers used the third overall pick of the draft on center Joel Embiid, but injuries have prevented him from participating in an NBA game. Last year the Sixers first-round pick was center Jahlil Okafor. Unlike Noel and Embiid, Okafor was able to suit up as a rookie for the Sixers as he averaged 17.5 points and 7 rebounds in 53 games before a knee injury cut his rookie campaign short. However all three players are healthy and it should give the 76ers a huge advantage in the front court. The good things for the folks in Philadelphia is that it can’t get any worse than it has already been. Colangelo is working to bring a competitive team to the City of Brotherly Love and the 76ers should be an improved team this season. Last year was a sign of things to come for the Brooklyn Nets. The Nets lost 61 games last season which was the third worst record in the NBA and the icing on the cake was that they didn’t have a first-round pick to show for their futility. The Nets are still suffering from the moves that were made by former general manager Billy King as most of their recent and future picks are now property of the Boston Celtics after the team’s failed attempt to become an instant title contender in 2013 when they acquired aging players such as power forward Kevin Garnett and small forward Paul Pierce. The Nets run at a title was short lived as they are coming off of their worst campaign since 2010 when they were still the New Jersey Nets. Nets owner Mikhail Prokhorov has finally realized that winning an NBA Championship is not an easy process and instead of the quick process, he has finally decided on the slow, methodical process. Prokhorov has hired Sean Marks as the Nets new general manager and he’ll be tasked with making Brooklyn respectable. Marks played for 11 seasons in the NBA and he won a championship as a member of the San Antonio Spurs in 2003. Marks has spent the last four years working in the Spurs front office and he is looking to bring some of that winning formula with him to Brooklyn. Marks’ first order of business was to hire a new coach in Kenny Atkinson. The Nets will mark Atkinson’s first head coaching gig in the NBA, but he has had stints as an assistant coach in the league with the New York Knicks and Atlanta Hawks. And now that Atkinson is running the show in Brooklyn, you can expect him to preach ball movement for the Nets. One of the few bright spots that the Nets have on their roster is center Brook Lopez. Lopez is coming off of one of his best NBA seasons as he averaged 20.6 points and 7.8 rebounds in 73 games for the Nets. Lopez gives the Nets a solid presence in the post, but trading him to a contending team could return draft picks to Brooklyn that will be needed in order for them to turn things around. Aside from Lopez, the Nets are a team that is mainly comprised of youngsters that are thankful to be on an NBA roster and veterans that are attempting to hold on. This past summer the Nets signed point guard Jeremy Lin to a three-year, $36 million deal as they are hopeful than he can give them a dose of “Linsanity” as he did when he suited up for the Knicks in 2012. Rookie shooting guard Isaiah Whitehead is a native of Coney Island and he won’t be fazed by playing in front of the hometown fans as he could have a positive impact on this team. The Nets will be fighting an uphill battle all season long as they have finally come to grips of the reality that is their rebuilding process.